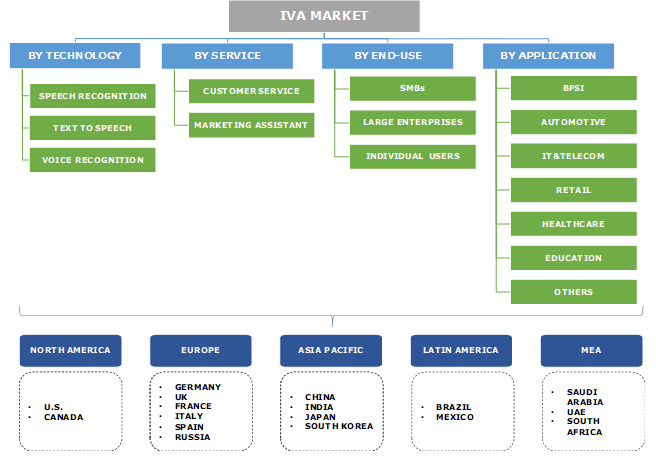 Intelligent Virtual Assistant (IVA) Market size was over USD 1 billion in 2017, growing at a CAGR of 37% from 2018 to 2024. Intelligent virtual assistant market is expected to grow over the next six years due to the advanced features such as the ability to recognize different languages, interact in natural language, and respond via text or voice. For instance, Alexa by Amazon can perform a myriad of tasks spanning from setting up schedules to shopping on online shopping platforms. DigitalCX by CX Company analyzes & understands the questions asked by the users and provides cross-sell opportunities based on consumer interest. Increasing penetration of the technology in smartphones and the growing adoption of smartphones are propelling the intelligent virtual assistant market growth over the forecast timespan. The technology allows consumers to perform simple tasks easily without any physical involvement of the customer. Furthermore, it also allows customers to gain necessary information effectively instead of waiting in queues for customer service. The technology is being deployed in mobile devices, enterprise websites, and social media that enable constant communication with clients. For instance, companies install virtual assistants to provide brands or product information to clients to increase the brand awareness. In addition, it also helps in promotions by asking new users to sign into the company's loyalty account. Customer engagement solutions emphasize on providing enhanced direct experience and help companies in increasing revenue, expanding margin, and improving customer satisfaction and retention. Speech recognition is expected to exceed USD 7.5 billion by 2024 due to the implementation of the technology on smartphones, propelling IVA market growth. The technology is allowing customers to easily interact and perform tasks with smartphones. The industry verticals, such as BFSI, retail, and education, are using the technology to improve the quality of operations and conduct business operations with ease, thus aiding the intelligent virtual assistant market growth. Consumer service segment is expected to hold a majority share and is expected to grow at a CAGR of over 37% over the forecast timespan. Exponentially increasing customer expectations and the growing need among companies to fulfill their demand are propelling the demand for these services. The technology allows companies to respond dynamically to satisfy customer demands and answer their queries. It also allows companies to handle large amounts of customer requests and respond effectively & efficiently. The IVA market demand in large enterprises is expected to grow rapidly to exceed USD 6.0 billion by 2024. An increasing number of large enterprises is adopting the technology to increase revenue and reduce the dependence on humans for customer service. Industry verticals including banking, IT & telecom, and retail are replacing traditional systems with these systems to improve the return on investment. SMBs in intelligent virtual assistant market accounted for over 30% revenue share 2017. Advantages of the technology including reduced operating costs and improved business operations are encouraging SMBs to adopt these solutions. Reduced requirements of the human workforce to cater to customer service requirements are allowing SMBs to incorporate the technology into businesses, thus propelling the IVA market growth. The intelligent virtual assistant market in automotive applications will grow significantly with revenue set to exceed USD 2.8 billion by 2024. The industry is being driven due to the increasing use of technology in connected cars. For instance, in 2016, Nuance Communications announced the launch of Dragon Drive Automotive Assistant, a virtual assistant platform for connected cars. The platform enabled users to personalize the in-car experience and offer assistance to drivers to mitigate risks while driving, thus propelling the industry growth. The IVA market in BFSI applications is expected to grow at a CAGR of over 20%. The adoption of technology in the BFSI sector is mainly due to benefits offered by the technology such as quickly finding answers to queries and reducing the response time. The technology responds to customer queries while making transfers and paying bills. The technology has enabled customers to gain customer service at all times and reduce the call waiting time. 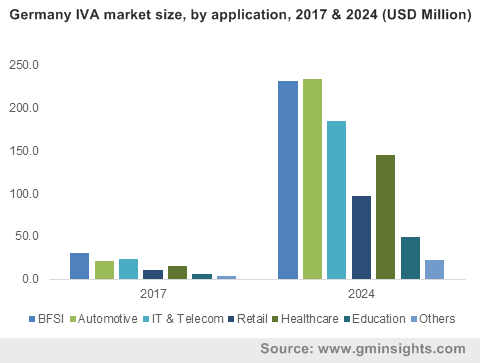 The Germany IVA market was valued at over USD 110 million in 2017 and is expected to grow owing to the adoption of smart devices in the country. Technological adoption has resulted in an increased adoption of applications such as MS Office Online and Skype in enterprise applications. Furthermore, the adoption of voice assistants in consumer devices such as smart speakers has rapidly increased over the last five years. According to a report published by Federal Association for Information Technology of Germany, about 13% of people own voice-enabled devices, thus fueling the intelligent virtual assistant market growth. The Asia Pacific intelligent virtual assistant market is expected to grow significantly over the forecast timespan due to the increasing need to automate and fulfill tasks such as managing schedules, playing music, and answer questions. The industry is expected to grow in countries including China and India with a high focus on offering self-service to customers. Key players in the intelligent virtual assistant market include Clara Labs, IBM, Nuance Communications, Creative Virtual, InteliWISE, Artificial Solutions, eGain Communications, 24/7 Customer, Inc., and Anboto. The industry is highly competitive and is driven by continuous innovations & technological advancements. These companies need to differentiate to gain a competitive edge and hence they invest heavily in R&D. For instance, in 2015, Amazon launched its voice simulated software, Alexa that answers questions and responds to user requests. The company offers advanced features to differentiate the technology from competitors such as Siri by Apply and Bixby by Samsung. The advances made in recent years in the fields of conversation interfaces, natural language processing, machine & deep learning processes, and automation has enabled the growth of the industry. Some of the early examples of the technology include IBM Shoebox and Harpy developed by DARPA. By 1990s, digital speech recognition became a feature of personal computers launched by Microsoft, Philips, and IBM. The first IVA installed on a smartphone was Siri, introduced as a feature of iPhone 4s in October 2011.